The eared hutia occurs in mangrove forests. The communal nests it reportedly builds in mangrove trees are circular, measuring about 1 m (3.3') in diameter, and are built out of mangrove branches and leaves. First described in 1970, the eared hutia is known only from Cayo Fragoso, a small, low island off of north-central Cuba. Previously the eared hutia was hunted by fishermen. First described in 1970, the eared hutia is known only from Cayo Fragoso, a small, low island off of north-central Cuba. 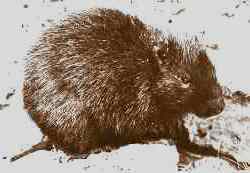 Previously the eared hutia was hunted by fishermen. The eared hutia occurs in mangrove forests. The nests the eared hutia reportedly builds in mangrove trees are circular, measuring about 1 m (3.3') in diameter, and are built out of mangrove branches and leaves. 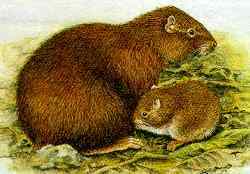 The eared hutia has been reported to build communal nests.